Bushwick, New York: Is this New York City's new coolest neighbourhood? "The East Village moved across the river to Williamsburg first," Loren Beri says. "And when Bob Dylan's spirit went across the river, it eventually trickled all the way here to Bushwick." If that's the case, I'd like to think that Dylan's spirit is hovering about us now, as we sip coffee at Wyckoff Starr, a cafe in this up-and-coming Brooklyn neighbourhood east of Williamsburg. Beri, a theatre practitioner and musician who moved here from his native Indiana, fits neatly into New York City's gentrification cycle. Everyone knows how it goes. Artists locate a downbeat district out in the boroughs where the rents are low, containing empty industrial buildings which are perfect for studios. They move in, creating a vibe which encourages more newcomers and the establishment of cool cafes and bars. Eventually this activity makes the place too expensive, and the buzz moves on. In the case of now pricey, hyper-hip Williamsburg, it seems to be shifting to Bushwick. "It's the promise of being in proximity to something inspiring and interesting and current," Beri says, as we huddle around a small table beneath images from the 1990s TV series Twin Peaks (like hipster vintage icons, undergoing a rediscovery in the 21st century via the screening of a new series). "There are so many visual artists renting studio spaces in these giant former warehouses. And Bushwick Open Studios is a big festival in June. It's a parade of neon-wearing, art-loving people going from building to building, each filled with new and interesting art." Though Bushwick may be riding the crest of a wave, Beri is aware the vibe may eventually move on. "There's a simultaneous excitement and sadness," he says. "The recognition of something being beautiful and present, and that this is not going to last. This is the end of the beginning of the end, or however you want to see it." With that transience in mind, I've spent the morning walking from the Morgan Avenue subway station in the north of Bushwick, past the Jefferson Street station on Wyckoff Avenue in the heart of the neighbourhood. Judging from my walk, Bushwick is still in the early days of the upswing, with islands of hipsterdom focused on particular stations of the L subway line, with light industry and older established resident groups between. The area around Morgan Avenue is distinctly industrial in appearance, its streets lined with former factories and warehouses. One of them, The BogArt, is home to artist's studios. Some of them open to the public as galleries later in the week. There's also food and drink on offer, with bars and restaurants inhabiting smaller ex-industrial spaces. One of the most popular, Roberta's, is marked only by a red booth-like entrance with a flamboyant letter "R". Through this door there's a big open space with long benches and an open kitchen turning out excellent wood-fired pizzas. Nearby at Tutu's, cocktails are served at a copper-topped bar. Ben, the young waistcoated barman, mixes me an excellent Strawberry Blonde with house-infused jalapeno tequila, strawberries, rhubarb jam and lime. Does he think this is the next Williamsburg? Ben laughs at the idea of Bushwick being one of the world's coolest neighbourhoods, as claimed by The New York Times and Vogue. He loves the area, he says, but thinks it still has a few years to go before it hits its peak. Walking to Wyckoff Avenue, I pass Better than Jam, a shop selling art and craft items created by local artists, then head along Starr Street in search of a survivor from Bushwick's pre-hipster era and established Hispanic community. Tortilleria Mexicana Los Hermanos is a no-nonsense shopfront selling a range of tacos, tostadas and quesadillas, all filled from the same basic list of ingredients. They're delivered wrapped in foil to diners sitting at plastic tables in the adjoining industrial space, and are cheap and delicious. This simple meal is a reminder that no one really "discovers" these neighbourhoods except the locals who were already there. 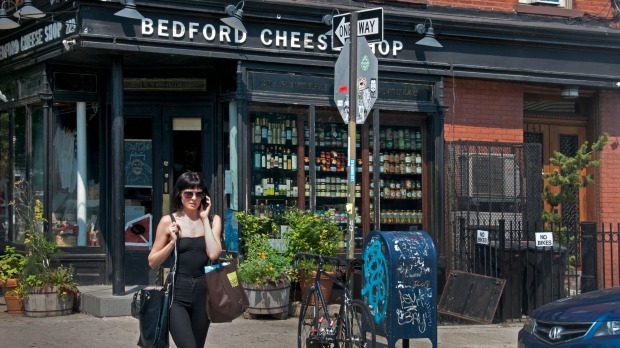 Is Bushwick really the next Williamsburg? Maybe. But it's also the old Bushwick, with a personality all its own. Qantas flies to New York via Los Angeles. See qantas.com.au.